India has for long been known for fragmented technology deployment that has lead to islands of automation and pockets of excellence. But when it comes to Smart Cities, a structured approach is paramount to Smart Cities seeing the light of day in India. With states moving forward with their individual programs for creation of Smart Cities, there are a variety of approaches, at play currently. How Do Developed Nations Approach Their Smart Cities Program? If you look at developed nations and their Smart Cities program, you will find that a detailed Smart City policy came first. This was followed by creation of Institutional Capacity within the Government and City Administration teams. Next came exploring innovative funding and partnership models to harness finances of the scale required for Smart Cities and to ensure that funding did not run out half way. Once this was done, projects were formulated in consultation with key stakeholders. These projects had the best of technology, financing, policy support and institutional backing to ensure their success. Technology being a key element of these projects, successful Smart Cities, engaged technology firms early on in the project at the conceptualization stage itself. This ensured that the projects conceptualized were futuristic and not only implementable, but were also rapidly scalable. 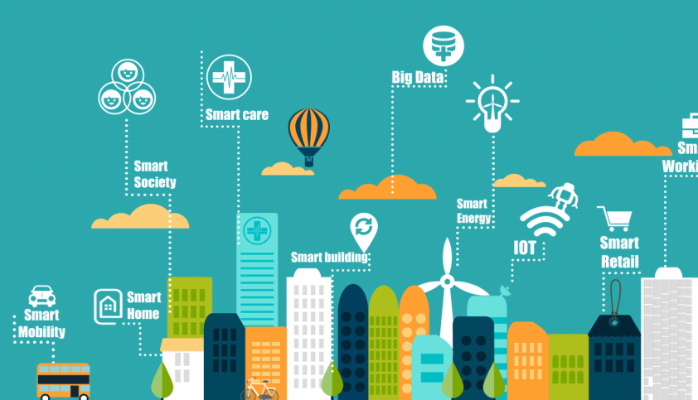 So what is India’s Smart City Approach? What Is Being Done About The Funding Gap? Currently there is a huge funding gap in the Smart Cities Program. The key element of funding is yet to be addressed. With the Government funding just about 20% ($30 bln.) of the overall funds required for Smart cities, it is imperative to get the private sector engaged early on to fund the remaining 80% ($120 bln.). The question is- Is enough being done to engage the private sector? Also, can this be left to individual states? How Will Capacity To Conceptualize And Manage Large Futuristic Smart Cities Projects Be Built Up? Capacity to manage large infrastructure projects, particularly the ones that have a high element of technology in it, has been limited in the government. Take the case of Metro rail transport that has been set up in some cities and is underway in others. If you compare the Kolkata Metro Rail project which was the first one of its kind in India with the Delhi Metro Rail project which came up next, there are huge differences. Kolkata Metro construction work was started in 1974 and it took 10 years for the first segment of 3.4 km with five stations to be operational. With intermittent construction thereafter, services on the entire stretch of the Metro were introduced from Sep. 1995. Contrast this with Delhi Metro. Physical construction work on the Delhi Metro started in Oct. 1998. The first elevated line of the Delhi Metro was inaugurated in Dec. 2002 & the first underground line was inaugurated in Dec. 2004. The first phase of the project was completed in 2006 on budget and almost three years ahead of schedule, an achievement described by Business Week as “nothing short of a miracle”. In contrast the Kolkata Metro implementation was 12 times over the budget and inordinately delayed. The point is- institutional capacity to conceptualize and manage complex technology driven infrastructure projects, varies from state to state and therefore the outcomes also vary considerably. How does the government plan to build capacity of City and government officials managing Smart Cities? How Are Innovative Funding Models Being Explored Currently And Are These Adequate For Smart City Projects? At this moment there is considerable reliance on government funding to make Smart Cities happen. But, is this the right way to go? In all probability this approach will not lead to sustainable Smart Cities. The city of Rio De Janeiro in Brazil for example, is trying to tackle its funding constraints by importing innovative ideas and management styles from the private sector, and keeping on top of innovations that come out of the private sector. Almost 35% of the investment managed by the municipal government is from private investors. Public Private Partnerships (PPPs) are being exploited in Rio to manage these investments. In the past, PPPs had been extremely difficult to execute due to bureaucratic barriers, but regulation has since been changed to facilitate public-private relationships. The success rate of our municipalities in accessing private sector funds remains very low. Keep in mind that municipalities are often at the forefront of smart city deployment and management. The city of Stockholm launched Sweden’s first pre-commercial procurement with the Swedish Transport Authority for new smart traffic solutions. Instead of procuring a solution, they have advertised the problem, with the aim of getting different companies and organizations to formulate solutions. This is an open competition, and encourages innovative and creative approaches to problem solving. Are our Smart Cities looking at such models? Is there adequate knowledge of and capacity to manage procurement on such models? The answer is- it is very limited and not enough to power Smart Cities across the board. Is There A Strategy Differentiator Between Greenfield and Brownfield Projects? And, If So, Is It Appropriate? India has a mix of Greenfield and Brownfield Smart Cities planned. However if you look at the Smart Cities planned you will find an overwhelming majority of these are Brownfield cities. This introduces a completely different level of complexity and a radically different set of problems. Considering that Brownfield Cities already have infrastructure built and people living in it, making dramatic changes to the existing infrastructure is neither simple nor practical. The issue is- most states have planned to improve infrastructure and services as a part of their Smart City initiative but this may not necessarily lead to the setting up of Smart Cities. The strategies to set up Brownfield Smart Cities are significantly different from those of setting up Greenfield Smart Cities. Have our target Smart Cities in India taken this into account. In all probability, the answer is -no. Will There Be A Parity From A Citizen Standpoint On Smart Cities That Will Finally Emerge? Each of the 20 Smart Cities currently identified is pursuing its own agenda and implementing its own idea of smart cities. The current selection criteria for Smart Cities is based on the areas of improvement listed by each city. Will this really create Smart Cities of international standards where citizens in different Smart Cities in India could expect some parity on the infrastructure and services available to them? Involving citizens in the process of selecting Smart Cities is a very appropriate measure. However, will using just this input to design and develop Smart Cities lead to sustainable world class Smart Cities? Will these cities not only be Smart when they are built but also scalable as the population grows? The answer is anybody’s guess….